AT A polling station nestled among mansions and marinas in the wealthy Miami suburb of Coral Gables, a tanned couple in designer sunglasses pause on their way back to their Porsche to explain how they voted in Florida’s Republican presidential primary. The man says he voted for Mitt Romney due to his knowledge of business and finance, which should equip him to tackle America’s economic ills. 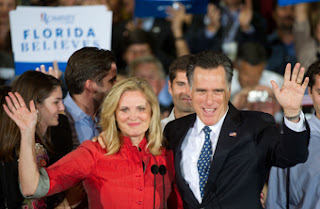 Plus, adds his companion, Mr Romney has a better chance than the other candidates of beating Barack Obama come November. BEFORE YOU MISINFORMED PEOPLE VOTE, LOOK AT THAT VIDEO ABOUT THE DIEBOLDT VOTING MACHINES! "IT IS ALL RIGGED" N.W.O. ?